Rusty Schlenk added his name to the prestigious list of Barney Oldfield Race winners on Saturday night that includes the likes of Matt Miller, Jeep Van Wormer, Duane Chamberlain, Kris Patterson, Shane Yoder and many more. 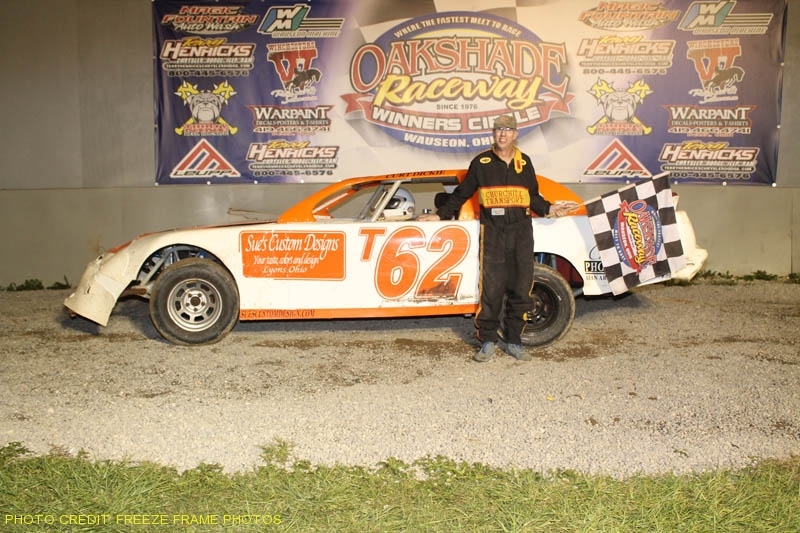 It was his fourth UMP Late Model feature win at Oakshade Raceway this year in the 21st Annual Barney Oldfield Race which added to his Oakshade point lead and will help pad his UMP National point lead. 2008 Oldfield winner Casey Noonan started on the pole, but got a little sideways in the first set of corners which allowed Schlenk to take the lead after starting on the outside of the front row. Brian Ruhlman applied some early pressure on the leader, but Schlenk began to pull away until a spin by Hillard Miller brought out the only yellow flag of the race on lap six. Schlenk fended off another challenge from Ruhlman for the lead on the restart and then set sail. Houghton Lake, Michigan’s Dona Marcoullier was the biggest mover of the race. He started 13th and by lap 11 was up to third. Just four laps later, Marcoullier took over second and began to slowly reel in the 91 car of Rusty Schlenk. Marcoullier only managed to close in to about a half straightaway behind Schlenk and then began to lose ground later in the race as Schlenk went on to win the $4,600 Barney Oldfield Race. Marcoullier had to settle for second followed by Brian Ruhlman and Rick Delong who gained ten positions to finish fourth. Pole-sitter and last week’s feature winner Casey Noonan wound up finishing fifth. The UMP Sportsman feature produced one of the more exciting finishes of the night. Brice Luttrell took the lead from Tim Fisher on a lap two on a restart after an early caution. Luttrell was trying to earn his third UMP Sportsman feature win of the year, but got held up behind some lapped traffic which allowed Rusty Smith to close in and challenge him for the lead. Smith pulled alongside Luttrell as the two drivers took the white flag. Luttrell had the lead entering turn three for the final time. His car then pushed up severely in turn four as Smith dove to the inside. Luttrell smacked the wall coming off turn four and Smith snuck by on the inside to take the checkered flag with Luttrell limping across the line close behind him for second. Rich Ruff started eleventh and ended up third. B.J. Gregory finished fourth with Oakshade’s UMP Sportsman point leader Mike Jessen ending up fifth. It took five tries to get the UMP Bomber A Main going as a full moon rose over the horizon. Once things got going, Tony Tolles, Jesse Moyer and Jim Plotts battled for the early lead. Billy Brown quickly closed in and snatched the lead away from Tolles by lap three and despite a late charge from Jeff Foks, Brown held on to pick up his first feature win of the year which catapulted him into the Bomber point lead. Foks who started 12th, worked his way to finish second followed by Curt Lancaster, Tony Tolles and Jim Plotts. Dylan Herman earned his fifth Hornet feature win of the year, holding off a late charge from defending track champion Derek Morris. Drew Smith came across the finish line third, but was penalized two positions for jumping a restart so he ended up fifth. William Cundick took third with Josh Froelich finishing fourth. Joe Cordes fought off heavy challenges to win the UMP Bomber B Main. Dan Shaffer followed Cordes most of the race trying everything he could to find a way around him. Danny Hogrefe joined the fray for the race lead late after he made contact with Chane Stuckey that sent him spinning down the backstretch. Hogrefe, Shaffer and Cordes came off the final corner three-wide with Cordes hanging on to pick up his first feature win of the year. Shaffer edged out Hogrefe for third. Karl Spoores and Jon Miller finished fourth and fifth respectively. Gabe Mueller shot out to the early lead in the UMP Bomber C Main, but Rick Dixon and Bob Krumm chased him down quickly. Krumm took the lead on lap five and didn’t look back on his way to his first feature win of the year. Dixon finished second. Tim McNicol got by Mueller to finish third and Nathan Goodman finished fifth. Saturday, July 3 is Memorial Night at Oakshade Raceway featuring action from the UMP Late Models, UMP Sportsmen, UMP Bombers and the Hornets while remembering fallen members of the extended Oakshade Raceway family that includes drivers, crews, track personnel and even fans. Gates open at 4pm with racing at 7pm. Race fans were greeted to a warm and sunny Sunday afternoon 200-lap enduro race at Oakshade Raceway that was won by Rob Liaeff. Shawn Stamm from Archbold, Ohio, set a blistering pace early and led the first hundred laps of the event. Unfortunately for Stamm, mechanical issues would force him to the pits for an extended stay. Jim Sayler also succumbed to mechanical issues after running second the for quarter of the race. By lap 125, Rob Liaeff took command of the race and soldiered on to the finish. He managed to keep his car out of trouble avoiding other drivers and debris, and he made his equipment last to the end to earn the $1,000 for the victory. Brad Gilbert finished second followed by last year’s Oakshade enduro series champion, Chris Williams. Chris Osborn was fourth and Neil Shaw survived to finish fifth. The next 200-lap/2 hour enduro race at Oakshade Raceway is scheduled for Sunday, September 19, 2010. Severe weather forced Oakshade Raceway officials to suspend the Wallace Racing Products Night racing program immediately following an exciting UMP Late Model feature in which Rusty Schlenk earned his second consecutive feature win after a hard fought battle with Houghton Lake, Michigan’s Dona Marcoullier. Mike Miller started on the outside of the front row of the UMP Late Model feature and ran strong early leading the first couple laps. Marcoullier took command on lap three after moving around the outside of Miller and then began to pull away from the rest of the field. The only caution flag flew on lap 11 for a tangle involving Ron Miller, Donnie Marcoullier (Dona’s father) and another driver. That wiped out Dona Marcoullier’s large lead with Rusty Schlenk lurking in fourth on the restart. Schlenk worked his way up alongside Marcoullier and the two drivers battled side by side for the lead for most of the second half of the race. Schlenk finally edged into the lead on lap 20 while Marcoullier reclaimed the top spot one lap later. Then Schlenk took over for good on lap 22 while working through lapped traffic and went on to lead the final three laps. It was the third Oakshade feature win for the national UMP Late Model point leader. Dona Marcoullier had to settle for second with pole-sitter Devin Sheils taking third. Rick Delong and Brian Fisher finished fourth and fifth respectively. Local weather observers reported severe weather with possible tornadic activity approaching Oakshade Raceway at the conclusion of the UMP Late Model feature. With darkening skies and lightening lighting up the skies to the west, Oakshade officials decided to suspend the remaining feature events so that race fans and crews could seek shelter. Those remaining features will be made up next week as part of the Leupp Outdoor Equipment Night American Late Model Series $2,000 to win show. Sportsmen, Bombers and Hornets will have double features. Gate open at 4pm with racing at 7pm.